The Louisiana Capitol Park Welcome Center Garage, completed in 2007 at a cost of $8.4 Million, is designed to hold 340 cars. Kessels Diboll Kessels was Prime Architect for this project that is situated on the square bounded by Lafayette Street, North Street, and River Road. The structure is located adjacent to the recently completed Louisiana State Visitors’ Center and provides supplemental parking for State Employees. 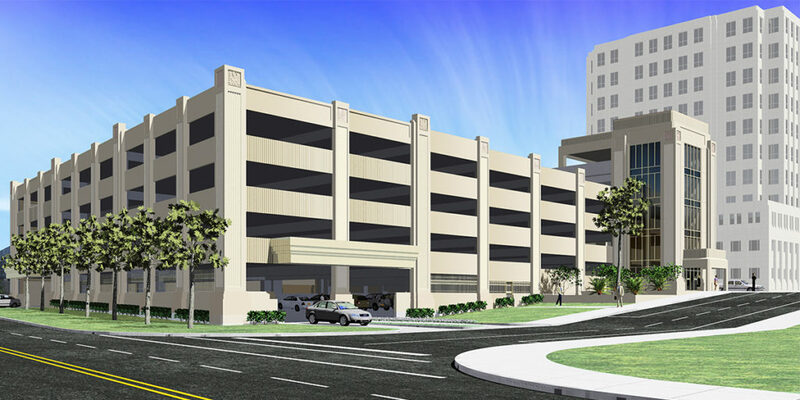 Complementing the Louisiana State Capitol Building and other State Buildings that make up the Capitol Park, the design of the Welcome Center Parking Garage respects the Art Deco style of those buildings and incorporates style elements from those famous and familiar landmarks.